Fundamental questions: How is breathing achieved? What are the adaptations of the alveoli for gaseous exchange? 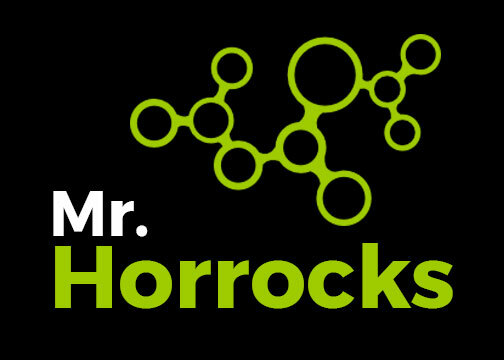 Objectives: Understand how breathing is produced using muscles. Ventilation: the bulk movement of air between the lungs and the environment. Cellular Respiration: the release of energy from sugars (happens in cells). 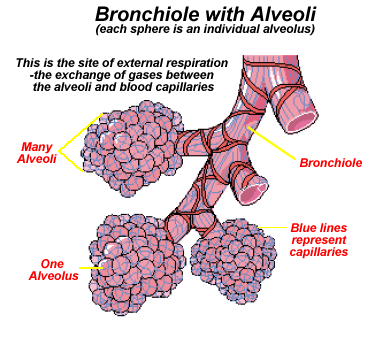 Alveoli: air sacs in the lungs that facilitate gas exchange. Cartilage: a flexible connective tissue made mostly from a structural protein called collagen. Alveoli in the lungs, where gas exchange occurs. 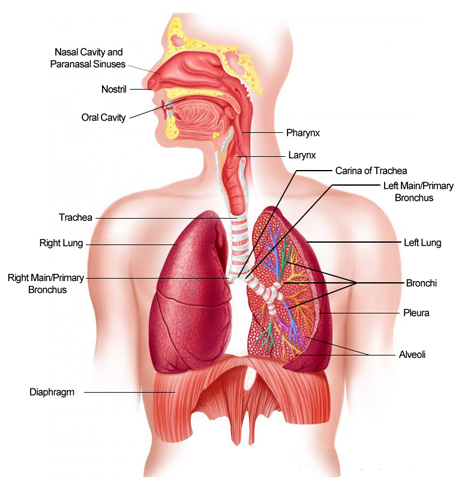 The lungs are covered with a membrane called the pleural membrane. This protects the lungs and reduces friction as they expand and contract. 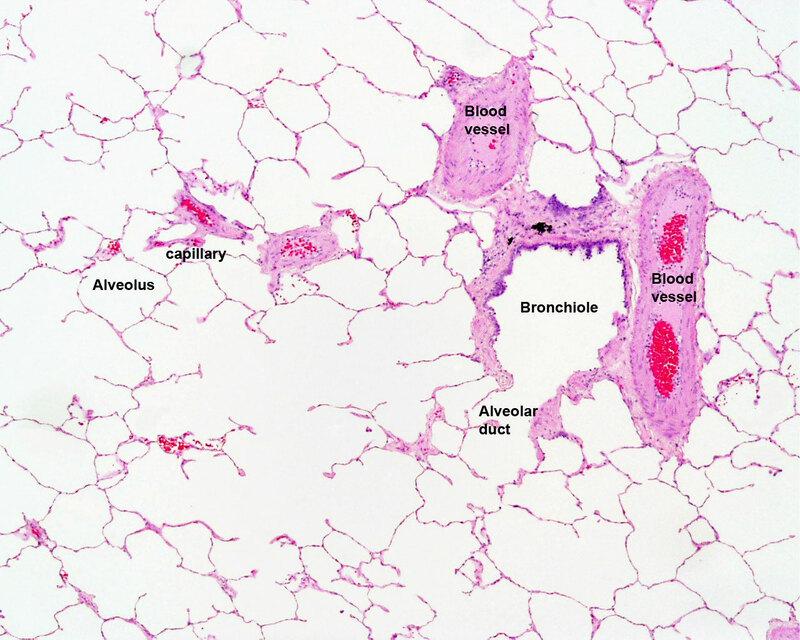 Lungs are spongy tissues, because they comprise mostly tiny air sacs called alveoli, as well is capillaries, connective tissues, and small air tubes called bronchioles. 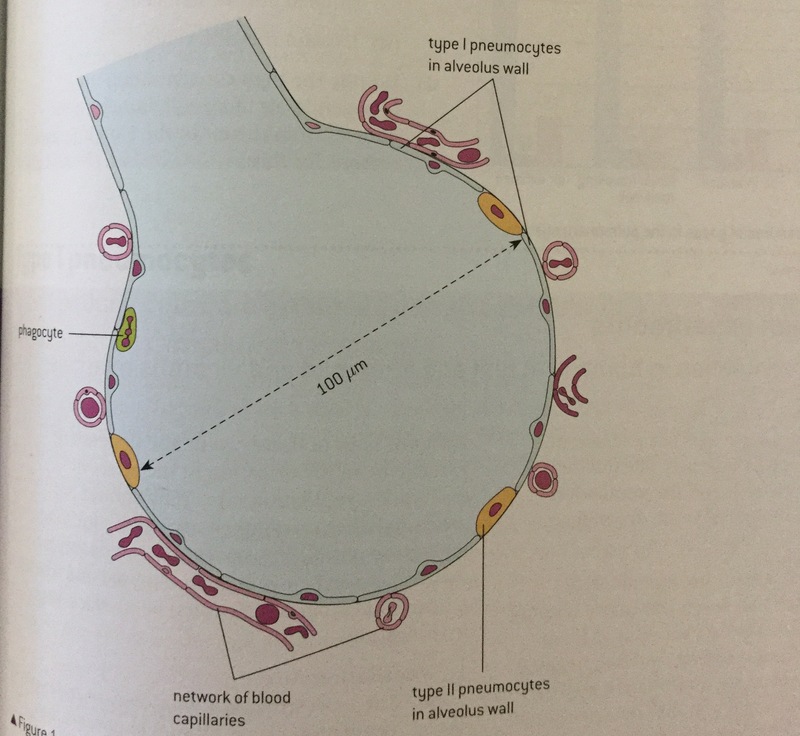 Gas exchange between the alveoli and the capillaries occurs by diffusion from high –) low concentration gradients. The alveoli are designed to facilitate this exchange. Inhaled air and exhaled air are compared in the table below. 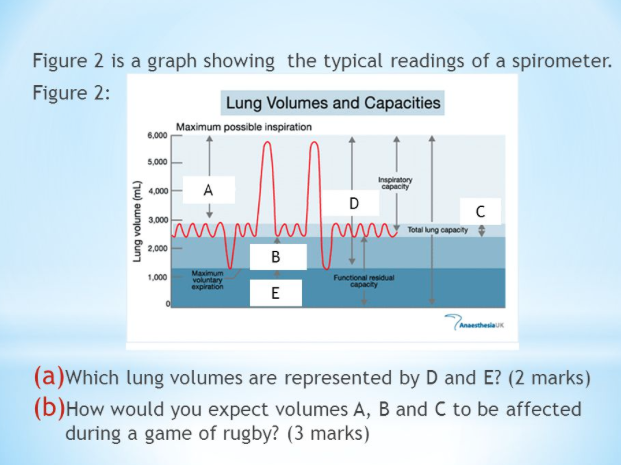 Q) Compare inhaled and exhaled air and suggest reasons for the patterns shown. How does breathing work? Breathing, or ventilation, is the bulk exchange of air between the lungs and the atmosphere. Ventilation is achieved by altering the volume of the thorax (thorax = part of chest including lungs), and therefore the pressure inside the lungs. The alteration of the volume of the thorax is controlled by muscles; principally the diaprhagm, internal and external intercostal muscles, and the diaphragm. In order to increase the thoracic cavity, the ribs also move upwards and outwards to some extent. This is made possible by the fact that out of the 12 ribs, the upper ten are attached to the sternum by flexible costal cartilage. Ribs 11 and 12 are actually not attached to the sternum, which allows for even more movement. The rib bones have two important layers of muscle, the internal intercostal muscles and the external intercostal muscles. These help to move the ribs upwards and outwards (inhalation), and downwards and inwards (exhalation). The two layers of muscle act antagonistically (in opposition). A.) Sketch on a human body outline the respiratory system. Label the pathway of air for a human body for inhalation and exhalation, using two colour coded pencils. 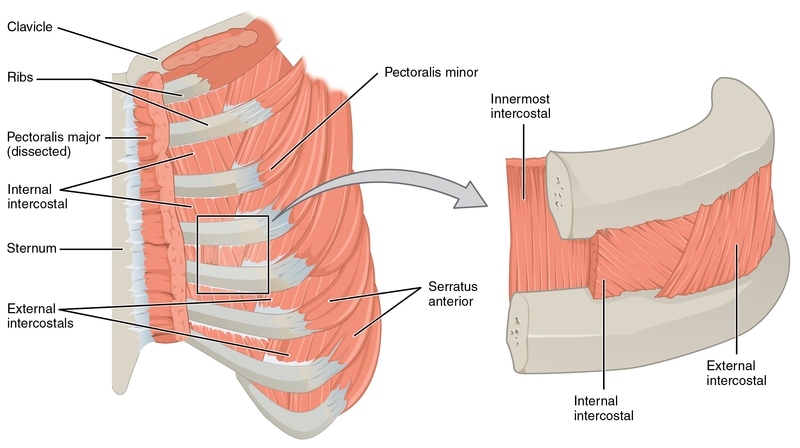 B) Build a table showing how the different muscles of the thorax (diaphragm and intercostal muscles) achieve the pressure changes indicated above. Bonus extension: Research the following respiratory conditions and share with the class; asthma, pleurisy, emphysema, bronchitis, pleural effusion. Gas exchange only occurs across the lining of the alveoli. Gas exchange occurs between the alveoli and capillaries. A spirogram is a graphic produced by a spirometer, which measures breathing or ventilation. A spirometer can be used in an investigation into breathing rates (this is not to be confused with a respirometer which measures cellular respiration). Task: Understand how a spirometer can be used in class (practical skills). Make some personal notes on how this is done. Emphysema: causes alveolar walls to break down, this reduces the surface area available for gas exchange. Smaller alveoli are replaced with larger alveoli, with thicker walls. This increases the distance required for diffusion and therefore reduces the efficacy.